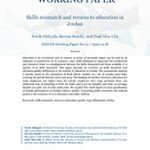 Home / Publication / Asset Inequality in MENA – The Missing Dimension? Studies of economic inequality have traditionally relied on income or consumption as their welfare aggregate. This is problematic, because households choose their labor market participation, and smooth their consumption over time based on their wealth. Neither income nor consumption measures welfare or inequality perfectly. Wealth must be accounted for as an economic outcome as well as a driver of lifetime opportunities. 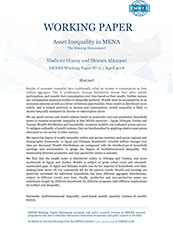 Since wealth is distributed more widely, and is related positively to income and consumption, overall inequality is likely to exceed inequality measured by income or consumption alone. 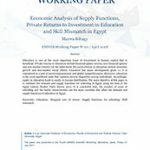 We use panel surveys and wealth indexes based on productive and non-productive household assets to examine economic inequality in four MENA countries – Egypt, Ethiopia, Jordan and Tunisia. Wealth distribution and households’ economic mobility are evaluated across surveys. To mitigate ordinality of wealth indexes, they are benchmarked by applying relative asset prices estimated in one survey to other surveys.